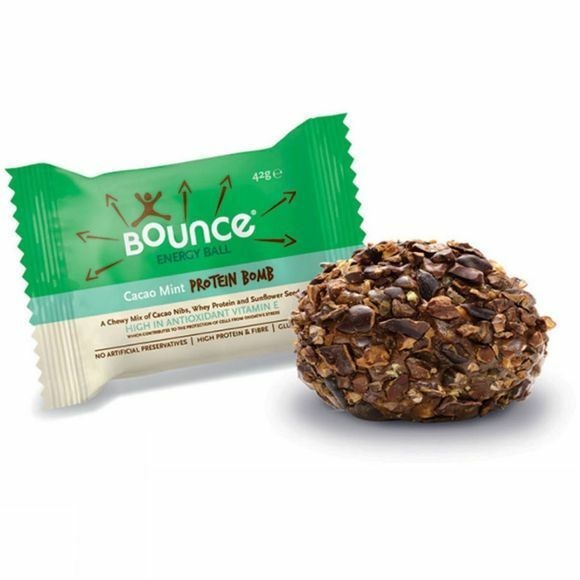 The Bounce Energy Balls are a super convenient and tasty way to nourish your body, satisfy your hunger and provide you with sustainable energy. Made using premium quality ingredients, these Balls are just what you need to sustain a healthy, active lifestyle. They include a unique combination of high quality proteins, carbohydrates, vitamins, minerals and good fats. Their unique blend of flavours and original shape make this product unique. Sunflower seeds (19%), brown rice malts syrup, cacao nibs, whey protein isolate (from milk)(10%), concentrated grape juice, gluten free grain dextrins (from brown rice), whey protein concentrate (from milk)(5%), rice bran, cocoa powder, gluten free oats, vanilla extract, pea protein concentrate, cocoa extract, stabiliser (guar gum), tapioca starch, sea salt, antioxidant (Naturally mixed tocopherois), stabiliser (calcium carbonate), emulsifier (sunflower lecithin), mint oil (0.2%).